I love this rotisserie. So far I've only done chickens, which came out nice, brown and delicious! Can't wait to try a roast. Worth every penny. This rotisserie will make some of the best food you've ever tasted. It is worth every penny of the cost. Two improvements I'd like to see though are the forks that hold the food are hard to clean (you need a toothbrush and some comet); also, I wish they would sell a basket that closed around the spindle so you could load food easier. Very quiet, easy to use, and for the lazy BBQ'r; you can put a chicken on and do absolutely nothing and come back 1 1/2 hours later and you are ready to eat. Cheers to Weber for another great product. The best BBQ toy I have ever bought! I love this thing. I just got it, put two chickens on, and 1.5 hours later was eating the juiciest, tastiest chickens I have ever had. No comparison with my smoker or beercan style...the rotisserie beats either method hands down. I had debated the purchase, thinking that this was just going to be another gadget I would use once and then never again. I had been told that the meat comes out no differently than if you just lay it on the grill, and that the motors on rotisseries are loud and obnoxious. Neither statement could be further from the truth. The meat is juicier due to the self-basting aspect, and the motor on this unit is virtually silent. Also, having the counterweight is a great plus for irregularly shaped items. This is a great purchase, and very well built in typical Weber fashion. Highly recommended. I concur with all the other reviews-this thing is da bomb!! Try pork roast on there-it is to die for. The rotisserie has never let me down, whether I'm cooking chicken, pork, prime rib, roast beef, lamb-you name it. Now mine is about 3 years old and the skewer does get a bit charred especially if you use smoke often. You need to SOS it and then you are good. You'll never buy one of those black plastic trayed chickens at the grocery store again! Superior to ANY restaurant! Weber's rotisserie couldn't be easier to install and to master. Instructions are very clear. So far I've spitroasted a leg of lamb, a pork shoulder and a chicken, and all came out juicy, crispy and flavorful. Have you guys tried useing the spit rods. You have to be kidding me. I cant keep my food on the grill with it. So i went looking for the next best thing for my favorite pastime and thats firing up the BBQ. And I stumpled across this cradle design rotisserie by weber. Well it fit perfect in my Genesis Grill. And with the falling out problems have any of you tried tightening the thumb screws? It work perfectly. You might have to stop it and retighten during the half way point because the meat does shrink as it cooks. And the ends come off to fit in the dishwasher, but if your doing some big "burn time" you might have to soak it on the dishwasher for a few mins But it was the best thing that I have bought for my favorite pastime. I use mine AT LEAST twice a week. Just so everyone knows, this product isn't actually manufactured by Weber. It is made by a company that has been custom designing this cradle rotisserie for commercial kitchens for over 20 years. They also make large catering equipment. They make this rotisserie for other grill companies like Viking, and Ducane. I bought mine directly from the company - EZ-Que, Inc. in Auburn Hills, Michigan. They are very popular where we live because they started marketing here first. I've been using mine at least 10 years - before Weber started carrying them a couple of years ago. The one I have is the exact same product. I give at least 2 or 3 of these a year as gifts - along with other cradle rotisserie products that EZ-Que, Inc. puts out- a campfire version called The Hobo, and a kettle ring rotisserie that fits Weber kettle grills. Mine still looks brand new, and I have NEVER encountered ANY of the problems that people mention in these reviews. I cook with it AT LEAST 2 times a week. 1. The 6" inch cradle is meant for cooking meats like chickens and small roasts. The 8" cradle is meant for cooking items like turkey and leg of lamb. The ones sold directly by EZ-Que come with a brochure that shows how to place different meats in the cradle. I don't think Weber packages this brochure with the product. 2. I have always cleaned mine in the dishwasher, and have never lost a part. If you soak the parts for 15 minutes they come out sparkling clean. 3. I have NEVER had meat fall out of the cradle. If someone is having a problem with that it must be because they have not read the instructions on how to place the meat. I have cooked things as small as . Ribs lie flat. You have to make sure to tighten down the clamps and finger screws. 4. EZ-Que, Inc. has a lifetime gaurantee on the cradle and parts. The motor that comes with the one marketed for Weber is not the motor that the company that manufactures the rotisserie sells with the cradle. The chrome plated motor that comes from EZ- Que is designed for the cradle. I have done a lot of business with the owner of the company over the years, and I know he takes a great deal of pride in his products. He loves to hear comments about what people think about his products. I just saw him at a barbecue industry show in California where the company took the product of the year award for his design. His name is John, and the company phone number is 248-373-0666. 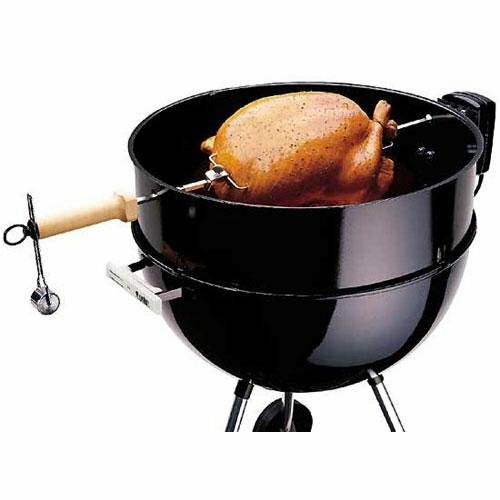 My reccomendation is to buy it straight from the manufacturer - the company always gives great service, can answer any questions about how to use the rotisserie, offers a life time warranty, and it comes with a much better motor. This is a superior rotisserie!!! I'm leaving mine in my will to my grandkids. I've been disappointed and thrown away at least a half dozen or more spit-rod rotisseries in my life. I thought I would give rotisserie cooking another try. Sure wish I owned the patents on this!! It's definately the wave of the future. As an engineer, I can see all the thought that went in to the design. I was intrigued by the whole concept of the style, design, and the apparent durability of it. This beats any other rotisserie I have ever seen. The design allows it to carry a lot more meat than a spit rod could. It's made out of all stainless steel which holds up to the heat and doesn't peel like the chrome spit rods do. The adjustable clamping arms hold any meat I put in it, no matter what shape. Depending on what you are cooking, the meat clamp tongs reverse to tightly hold. I just set my meat in the cradle, securely tighten the clamping arms and put it on the grill. It self balances, so I don't need that clunky counter balance that has killed every rotisserie motor I've seen. The motor that came with my EZQue is a real workhorse. It effortlessly turns the big loads of whole chickens and roasts. I have a large family that gets together for barbecue all the time. I followed the advice of one of the posters and bought mine from Innovative Cradle Rotisseries on E-Bay. From what I was told, they are the only company in the world that manufactures this ingenious advancement in barbecue technology. Come to find out, everything about the product is patented. It really IS a product that is past due. I spent a lot of time talking to the customer service person - I've never seen such great personal attention. They told me that Weber was given an exclusive for 3 years to market the 9891 and that is no longer being made. (When I called the Weber hotline to ask about the 9891, the only thing they could tell me is "This thing comes down and holds the meat." Not much help.) Then I called the customer service at EZQue, they are not only knowledgeable about their own products, but knew every detail about the grills that they make the product for. They ARE the authorities in rotisserie in my book. Although the company has been around since the early 80s they only sold through grill companies. They make them for all grills, not just Weber and they also make big ones for pigs and catering. Anyway, being a Weber fan, I strayed from the Weber brand name package and decided to buy direct. Am I ever glad I did. The EZQue one is a better made product than the 9891 - with a motor that is better suited to the job. I love my EZQue rotisserie so much I went back and ordered ones for all of my friends and family's grills for Christmas, and it's only July. I got a couple Webers, a Ducane, and Charbroil. They made sure that I got the right model for all my friend's different grills, and are even custom making one for a Jennaire for a grill my parents just bought. I bought a portable campfire one that I got to take with us to use on the beach when we go sailing, and a kit that I can build into my outdoor fire hearth at our cabin. My son in collage has a charcoal kettle, they had a rotisserie to fit that. They even shipped on to my brother overseas. Next year they are going to have a line for Charbroil, and Sunbeam. Now the pastor of my church is looking at getting a few of the 3 foot long double rotisserie EZQue grills to rent for events and weddings. Superior design, superior service, superior grill accessory, superior limited lifetime gaurantee. And, did i forget to mention how UNBELIEVABLY juicy and beautiful anything I cook on it turns out? Superior rotisserie cooking! The website is www.ezqueinc.com the toll free number is 877-377-2900. I'd like to say thank you to the person that wrote a review and lead me to the manufacturer of the Weber 9891 rotisserie. I found the website for the company, it's www.ezqueinc.com. My family LOVES to cook outside with our Weber grill, and we LOVE rotisserie cooking. I purchased a new rotisserie cradle directly from the E-Z Que people after I saw the review, and what I got today is a top of the line product. We barbecued with it tonight, and it works like a dream. We had the best rotisserie chicken cooked in one side and a pork loin roast on the other side, then we did a slab of baby back ribs. All of the parts were precision fitted, went together well, I got a diagram about how to place different meats in the rotisserie. Everything went perfectly. It cleaned up like a dream, I did as the company told me, disassemble the parts, place in the sink with soapy water, and let soak for about 20 minutes. Every part came out shiny with very little scrubing. I originally had bought what I think may have been a "refurbished" model that came with a plastic case motor. From what I hear in the reviews, it sounds like they were duped like I was the first time around. The company that manufactures the rotisserie told me they have a limited life time warantee, and do not sell or authorize anyone to refurbish their products. The one I got frome E-Z Que came with a much stronger metal casing motor - you can tell there is a big difference in the quality in the one I bought from E-Z Que, it seems to handle the turning better, is quieter, and runs smoother. My advice, from a customer that has gone from discouraged to elated.....This is one great product that proved everything it stated it could do. Make sure you buy the original. It cost me a little bit more, but, I think I'll be using this product for many years to come. I have enjoyed using my Weber for rotisserie cooking but since buying my first rotisserie about 8 years ago, I am now having to buy my 3rd motor due to it malfunctioning/burning out. I am surprised that with as nice a grill as it has been, that the motor hasn't lasted longer. I cook on the spit about 8 times a year. Weber was nice enough to replace the first motor at no charge. This rotisserie fits my 2003 Genesis Silver A just fine, and the chicken I cooked was nearly perfect. It browned beautifully and was delicious even though I hadn't brined it. That said, it's not perfect. I tested the counterweight but it unbalanced the rotation of the spit more than omitting it, so I left the weight off while cooking. It's nice to have in the event that I try to cook something large and unwieldy. I don't know if a turkey will fit on my grill (it's Weber's smallest), but I am looking forward to trying. I cleaned the spit and forks right after dinner with a scrub sponge and hot, soapy water. I needed an old toothbrush to get at the crevices in the locking mechanisms of the forks. The manual that comes with it doesn't specify if the forks are machine-washable or not, otherwise I'd have thrown them in the dishwasher. The spit also seemed to discolor slightly from the heat of the grill. It's much too large to put in the dishwasher, so the spit must be cleaned by hand. The power cord is exceptionally short. It barely touches the ground when the motor is attached to the grill. An extension cord is definitely required. Despite these faults, I am very satisfied with the rotisserie, and I would definitely recommend it to anyone. Just got mine 2 weeks ago - it's great! I have the Weber Gen. Silver "B" model grill and I too was confused as to whether this 9890 would work on my grill. I called Weber and was told that the 9890 was the one to use for spit rotisserie cooking. We received it two weeks ago..my first attempt was a boneless pork roast..I just seasoned it with a garlic rub and it came out so tasty and moist...the family raved! Yesterday, we cooked an 8.30 lb Perdue Oven-stuffer chicken on it and used just seasoned salt on the skin..again, kudos from the family. We are so happy we got this attachment. One thing though, we were hoping to cook a turkey on the rotisserie but I believe that we cannot cook a much bigger bird than our 8 lb bird. Does anyone know what the largest/greatest amount of lbs this rotisserie can hold? But if the oven stuffer turns out to be the max we had cook on this rotisserie, we are still so happy. Hope this helps others who are hesitating in buying this - go ahead..you'll love rotisserie cooking. Solid Non-Flexible Spit -- Sorry Motors! After brining my 13 lb turkey overnight, I started up the coals and set the turkey spinning. A little over 2 hours later, I took it off the grill and let the bird rest on the countertop. The smell drew every teenager in the house to the kitchen. The bird was completely picked over before I was able to make the rest of meal. So much for the other food groups. It was completely devoured. There was literally nothing left. My wife, daughters, and their friends kept repeating, "That was the best turkey I ever had. You deserve a trophy!" We now have their friends calling wanting to know when I'm going to roast another bird. Folks, this is a must-get addition to this grill. Forget about the chicken with the beer can up the old caboose. I am not the most experienced grill master in the world but this thing made me into a neighborhood hero.